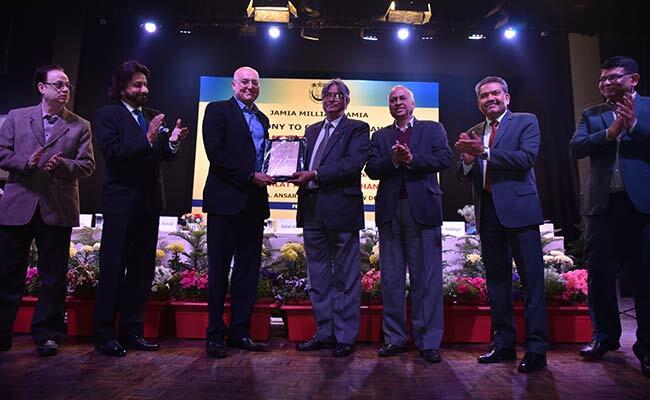 NEW DELHI: Founder of Hotmail, renowned entrepreneur and innovator, Sabeer Bhatia was conferred with Jamia Millia Islamia (JMI)’s highest award, ‘Imtiaz-e-Jamia’ for his ‘outstanding contributions to public service and for technological innovation for the benefit of the society’. US-based, Mr Bhatia, 50, was presented with a plaque with the citation and a shawl by JMI Vice Chancellor, Prof Talat Ahmad at a function in the university campus amidst loud applause by a large number of students, especially from Science and Technology faculties. The citation read: ‘JMI confers Imtiaz-e-Jamia on Mr Sabeer Bhatia, entrepreneur, philanthropist and innovator for his outstanding contributions to public service throughout his life’. Accepting the award, Mr Bhatia, who subsequently sold-off Hotmail to Microsoft in 1998, gave a stimulating talk on entrepreneurship and the future of information technology. Recounting his days as a student at California Institute of Technology and Stanford University, he asked the students to develop innovative ideas and be open to risks that come with entrepreneurship. With technology changing at a rapid pace, he said that, newer technology makes old technology obsolete. Neural networks are the new paradigm of technology, he said adding that, the Internet of Things (IoT) will bring in the next wave of revolution that will transform the society. “With IoT, all objects will have some intelligence device and will send data to the cloud which will be useful to all stakeholders”, Mr Bhatia said. Mr Bhatia said that Artificial Intelligence (AI) is future technology and it will bring sweeping changes in the lives of people and business as machines and the superior algorithm will outdo human intelligence. He said that though algorithms are good for machines, it is not how the human brain works or for that matter how a child’s brain develops. “Though algorithms may have more accurate analytical ability than human beings they lack the emotions that human beings can express,” he said. Vice Chancellor Prof Ahmad said that the idea behind instituting this award is to identify outstanding Indians across the world and give due recognition to them for the contributions towards the betterment of the society.